Screening is organised according to your GP practice. Once every three years your GP practice will be contacted and all women eligible for screening will be invited. You do not have to contact us to make an appointment, we will ensure that you receive your invitation at the appropriate time. 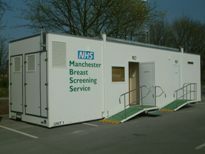 The screening programme also offers women over 70 a free breast screen every three years. Women over 70 will not be sent an invitation but are encouraged to call the unit to make an appointment that suits them. If it has been over four years since your last breast screening appointment then please contact us. We have a range of different locations where you can be screened and a range of appointment dates and times. We try to invite you to a screening clinic that is convenient for most women in your GP practice but we appreciate that this may not always suit you. the appointment request form so we can arrange an alternative location, date or time. Not every woman will receive an appointment as soon as she is 50. You will receive your first appointment before your 53rd birthday and therefore there is no need to contact us for an appointment.